Although most modern tractors have attachments made specifically for catching loose grass and other materials, they can be very expensive. In some cases, making your own bagger for your yard tractor can save you quite a bit of money, but this takes more time than installing the easy-to-assemble part you can purchase. With a few simple household items, you can save yourself the hassle of having to bag your own grass. 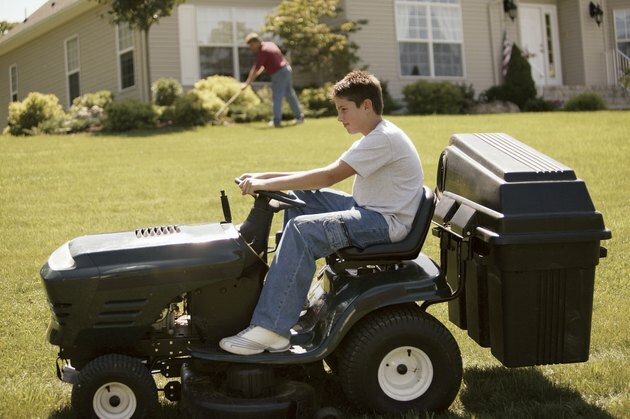 Making your own bagger can help you save time when mowing your lawn. Create a funnel chute to attach to the tractor, where the grass is expelled from underneath it. Form a three-sided box at an angle, using the poster board and duct tape. This will ensure that the clippings go from under the tractor and into the bag. Tape the funnel to the tractor on top of the clippings chute, using the duct tape to secure it. Locate an area where you can clip the garbage bag near the new funnel, preferably on the top and bottom or each side. Use a small bungee cord on each area to hold the bag in place on the funnel. Look for an area to clip the bag in close to the funnel, so that the clippings go directly into the bag. Open up a heavy-duty garbage bag so that the clippings will have ample room as they accumulate. Pull the tightening cord on each side of the bag, to connect to the bungee cords and hold it in place. Slide the bag opening over the funnel, and pull each bungee cord toward the handles of the bag. Hook the handles on each side of the bag with the bungee cord hooks, and pull them taut. Tighten the bungee cords by wrapping them around another part of the tractor before connecting, if they are loose. Look for gaps in the area where the bag and funnel meet. Close any gaps with duct tape, and start your tractor. Slowly start to move the tractor forward, to see if the bag drags or isn't clear of the tractor's undercarriage. Adjust the bag, if necessary. Mow your lawn. Inspect both the trash bag and the lawn, after completing the job. Look for loose clippings on the ground, to determine if there are any other gaps to fix in your homemade bagger. Are Vacuum Cleaner Bag Sizes the Same Between Brands?